Almost every time I’ve been to Moray it’s been raining – so much, in my case at least, for the famously fine weather! I’ll gladly take a soaking, though, if it means seeing a truly inspiring castle and a historic site or two. Two weeks ago I cycled from Huntly to Cullen, stopping at the scattering of towers along the way. 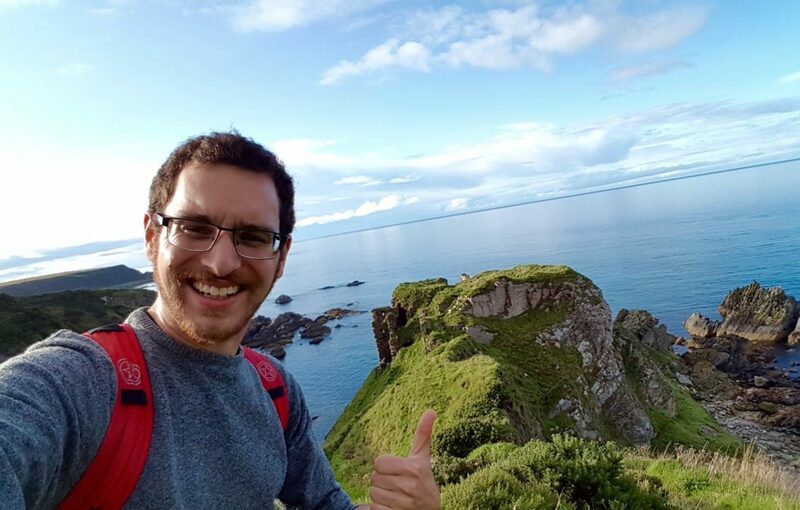 I was particularly looking forward to visiting Findlater Castle, a coastal ruin built into a promontory much like the more well-known Dunnottar Castle. 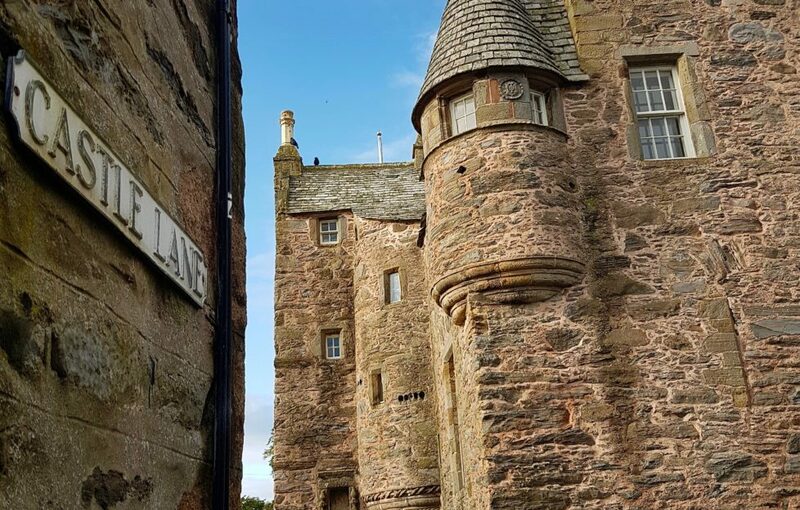 While Findlater alone turned out to be well worth the trek, two other nearby castles makes this neuk of northern Aberdeenshire one of the most rewarding corners of the country for castle lovers. This one was a bit tricky to find, and definitely qualifies as a ‘Backyard Castle’. At an entirely unassuming fence gate just over a mile east of Portsoy you have to go off-road and brave a forest of nettles. 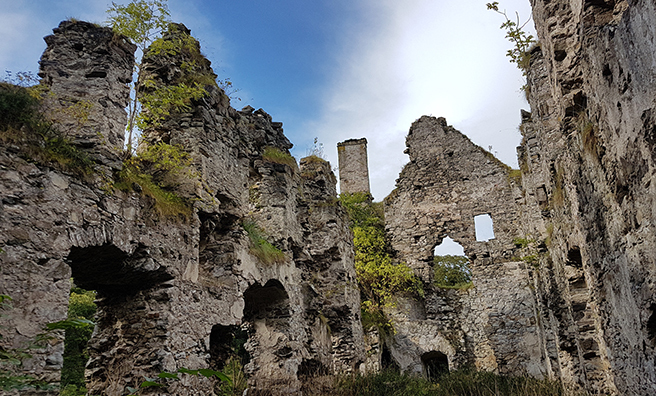 My philosophy of “it’s not an adventure unless I get a few new scrapes and scratches along the way” was sorely tested, but when I laid eyes on the ruins of Boyne it was all worth it. Giving off definite Indiana Jones vibes with crumbling towers and creeping vegetation, it’s a huge palatial complex that seems to always be hiding ever more components and crannies to explore. 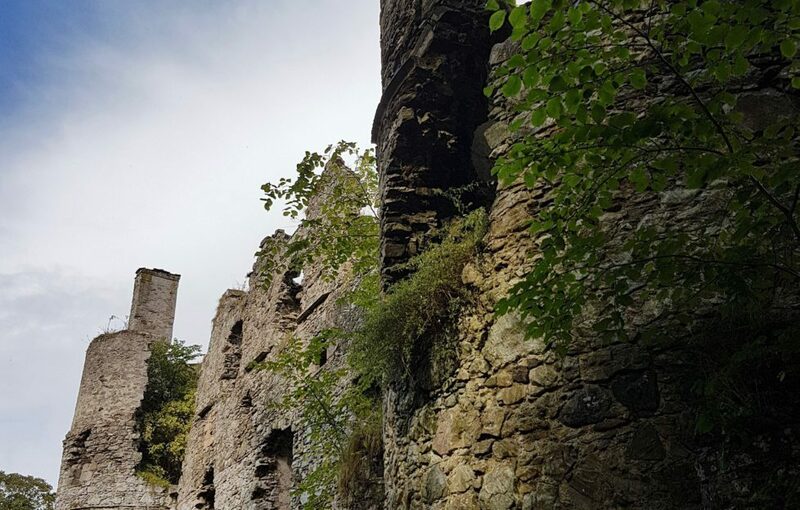 Built in the late 16th century by Sir George Ogilvy, it had two walled gardens and is flanked by a steep drop-off into the Burn of Boyne on three sides. Just remember to wear trousers and not shorts like this dafty if you visit to save yourself the painful approach! Around three miles inland from Portsoy is the village of Fordyce, a small place that leaves a big impression. I was immediately charmed as I rode into town by the small, cobbled streets and the obviously historic rows of houses. I actually managed to ride right past the castle itself as I was so distracted by everything else! 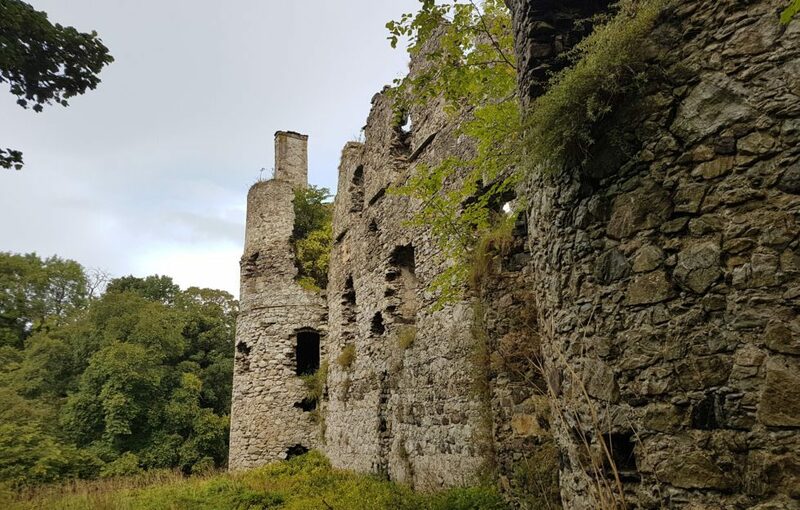 A classic L-plan towerhouse, Fordyce Castle dates from 1592 while the village has roots going back around 1,400 years. 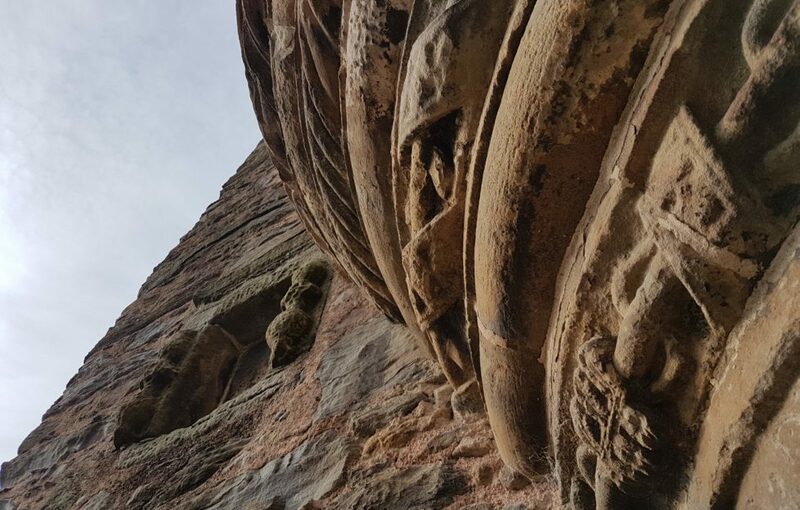 One of its most fascinating features is the complex designs on the corbelling near the entrance, which rival any carvings I’ve seen at much grander sites like Stirling Castle. 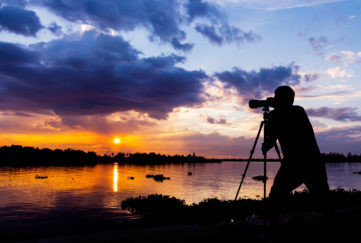 I was loathe to leave it behind, yet with my main target still ahead of me and the light slowly fading I pressed on and promptly had my breath taken away. This magnificent ruin gives the impression that the natural rock and earth grew around it over the centuries rather than the other way around. To me it seems so embedded in its promontory that it’s easy to imagine the entire rock being filled with chambers and secrets. Indeed, that’s not far from the truth. After taking in the sight of Findlater Castle from afar I scrambled down the narrow, slippery path and emerged straight into a “choose your own adventure” story. Everywhere a tunnel beckoned or a new view emerged, and I’m certain there are a few crannies of the castle that I missed. No bother, I will absolutely be back again. It even comes with an alleged pirate’s cave just around the corner which goes quite far back – far enough that I was guided solely by my phone light and turned around before I reached the back. My imagination was fired by images of pirates smuggling all manor of contraband under the watchful (or maybe even complicit?) watch of the castle. And if a castle with a pirate’s cave doesn’t get you excited, there’s nothing more I can do! Found it! 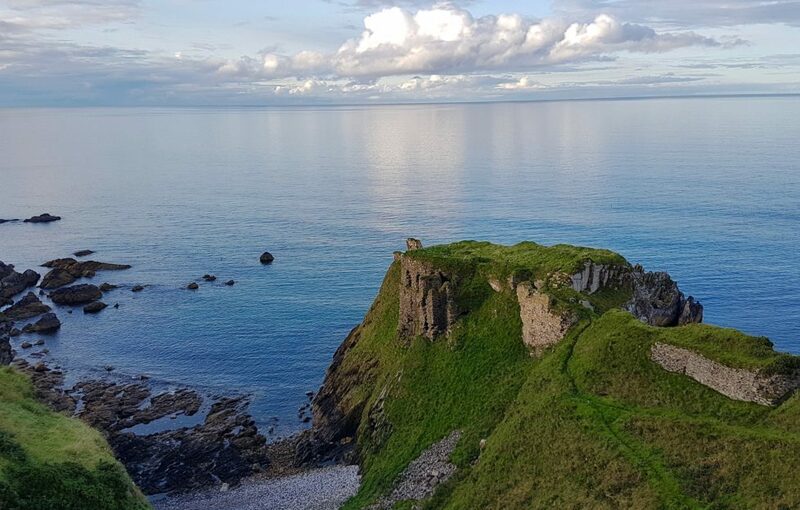 Findlater Castle sits out on a rocky promontory near Cullen. Pic: David Weinczok. Boyne Castle up close. Pic: David Weinczok. Complex and intricate carvings near the entrance of Fordyce Castle. Pic; David Weinczok. Was the castle built on the rock, or did the rock grow around the castle? Pic: David Weinczok. 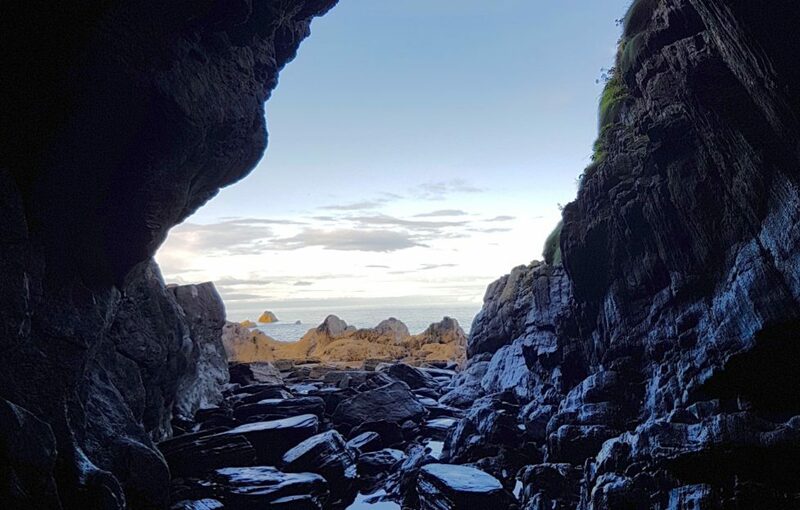 A possible pirate’s cave under Findlater Castle! Pic: David Weinczok.